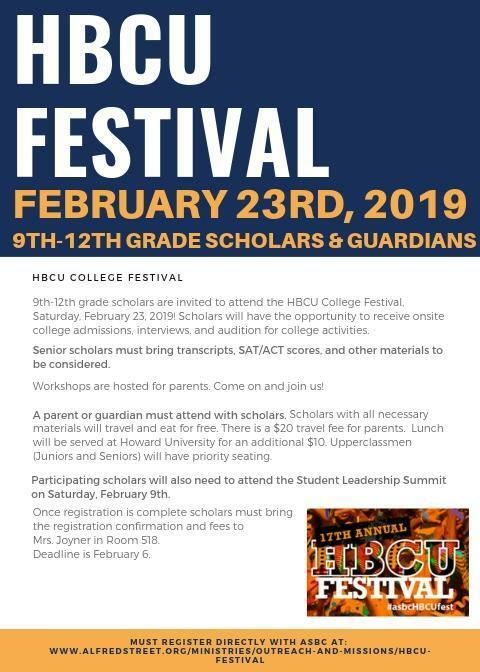 High School scholars are invited to attend the HBCU College Festival on Saturday, February 23, 2019. Scholars will have the opportunity to receive onsite college admissions, interviews, and audition for college activities. Senior scholars must bring transcripts, SAT/ACT scores, and other materials to be considered. Workshops are hosted for parents. Come and join us! A parent or guardian must attend with scholars. Scholars with all necessary materials will travel and eat for free. There is a $20 travel fee for parents. Lunch will be served at Howard University for an additional $10. Upperclassmen (Juniors and Seniors) will have priority seating. Participating scholars will also need to attend the Student Leadership Summit on Saturday, February 9th. Once registration is complete scholars must bring the registration confirmation and fees to Mrs. Joyner in Room 518. Deadline is February 6th.